The POSCO Music Concert is returning on the third Saturday of each month starting in February 2014 with a more enriched program. Since December 1999, leading Korean artists, including K-pop stars, have performed at the POSCO Music Concert. Even singer Psy made an appearance at the POSCO Center in July 2012 to perform his hit single “Gangnam Style”, as did popular K-pop singer, Ailee, last September. Marking 156 performances and over 140,000 cumulative attendees, the concert has positioned itself as Korea’s leading corporate sponsored music concert. With the purpose of bolstering social contributions, the three POSCO Music Concert keywords this year are ‘opportunity’, ‘passion’ and ‘challenge’. Unique to previous years that mainly focused on well-known pop artists, this year’s lineup brings together a collaboration of talented new artists and famous musicians. POSCO aims to create more opportunities to support up and coming artists to fulfill their dreams and also to provide a cultural arts space for the wider community. The 2014 POSCO Music Concert will offer a range of genres to listen to, from classical to ‘indie’ music, and even drum performances. Concerts will be held on the third Saturday of each month from February through December (with the exclusion of August) at the POSCO Center 1st floor Atrium. 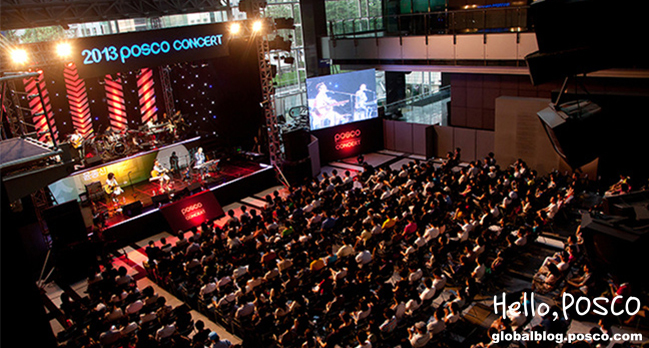 Those wishing to attend the POSCO Music Concert can request invitations from the POSCO website (www.posco.co.kr). February: The concert in February focused on the theme of ‘Openness, opportunity opened for everybody’ and featured Huh Gak, Gayageum Maidens and Mister Pa Pa.
March: Focuses on the theme of ‘high spirits’ and features the 10th anniversary of Richard Yongjae ONeilll and representative K-classic violinist, Zi A Shin. April: Focuses on the theme of ‘Full bloom, music concert to spread out dreams and hope’ and features young musicians that attend music schools in Seoul and their role model, conductor Geum Nan Sae. May: Focuses on the theme of ‘Challenge’ and features two artists that make the impossible possible – Korean ‘Paul Potts’ Seungil Kim and Yejoon Suh. June: Focuses on the theme of ‘Laughing flowers, music with laughter’ and features the Hamburg String Orchestra. July: Focuses on the theme of “Endless Passion, POSCO Auditions for Indiebands” and features a diverse range of indie bands. September: Focuses on the theme of “Opera that opens the heart”. October: Focuses on the theme of ‘A very special outing’ and features world renown pianist Yuhki Kuramoto, perfect vocalist Areum Lee and gifted pianist Sangwoo Lee. November: Focuses on the theme of ‘mutual understanding’ and features witty poet, Sangwook Ha and singer Sikyung Sung. December: Entitled the ‘Thank you Concert’, this concert concludes the 2014 lineup and features Youngnam Cho and vocalist ensemble Rotina. We had a chance to sit down with POSCO’s concert organizer, Seung-Kyu Yoon, to hear about his experiences and thoughts while planning the lineup for 2014. Why does POSCO regularly hold concerts at the headquarter lobby? I think the biggest reason behind POSCO holding these cultural music events is to make social contributions through sharing. POSCO is one of Korea’s most loved companies and as such POSCO feels that they should give back to the community as well. In addition to holding concerts at the lobby of POSCO’s headquarters, concerts and other cultural events are hosted in Pohang and Gwangyang as well. What is the most memorable moment you’ve had while planning or managing POSCO concerts? When you ask a chef ‘when do you feel most satisfaction?’, they will most likely say it is the moment when they see their guests enjoying the meal that they cooked. Along those same lines, as the organizer for POSCO concerts, I feel the most fulfillment when I see concert goers enjoy the performances or when I hear them say ‘that was really good, I am so happy to have had this opportunity’. It is those moments that make me feel that the hard work I put in was worthwhile. Who has been the most popular performer so far? Each concert receives a lot of praise but I must say that to date, the concert where Psy and Ailee performed were the more popular ones. The concert featuring Psy was especially exciting because he performed his world hit single, ‘Gangnam Style’ right inside POSCO Center. Many viewers actually even stood up to dance his signature horse dance! What has been the main focus for you as you have planned the 2014 concerts? While planning the 2014 concerts, I’ve kept in mind to do my best in everything that I do. The 2014 lineup is unique from past years in that we are moving the spotlight away from artists you may have seen a lot on TV or at major concert halls and instead focusing on musicians that are very talented but have not yet had the opportunity to really shine yet. POSCO is creating an opportunity for these up and coming artists to stand on the same stage with stars that they look up to as mentors. Through these experiences, it is our hope that these young artists can fulfill their dreams and move one step closer to realizing their full potential. If you could sum up POSCO concerts in one word, what would it be? I think ‘mutual understanding’ might be a fitting word. Since 1999, POSCO has organized concerts to create a space for communication and mutual understanding. I hope that you continue to show interest in the concerts that POSCO provides for the general public. Thank you! Spend some time exploring the fun public spaces in POSCO center during your visit to POSCO concerts. Steel Gallery: A fun experimental space where you can learn the history of iron and its various uses. 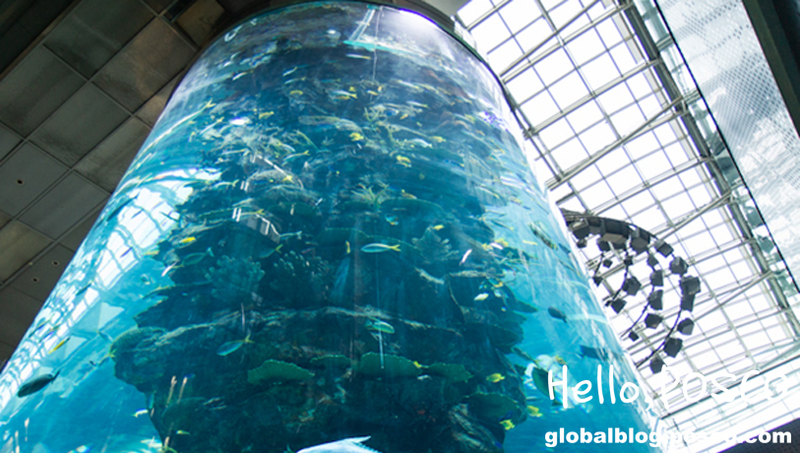 Aquarium: A 9 meter high aquarium that runs from the basement to the first floor. It contributes to a unique space in the urban area where people can interact with nature and enjoy the likes of sharks, napoleon fish, and 70 other kinds of sea life.